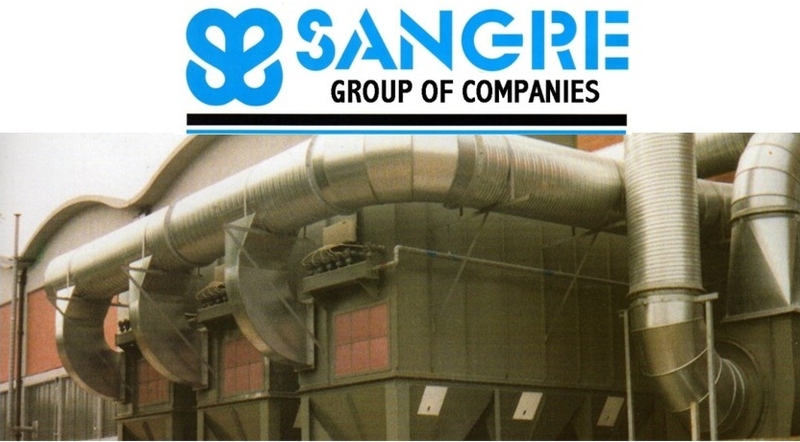 The Sangre DustAway series of dust extraction units are complete automatic dust collectors each contained within a single cabinet. They contain all the basic requirements of fan, filter, hopper, bin, auto shake as standard. These units have been designed with maximum efficiency and durability as prime considerations. By variation of filter fabric and disposal method each unit becomes tailored to the needs of the specific application so that an answer to your dust problem can probably be found within the DustAway range. Maintenance is carried out from the clean side of the filter media. Dust laden air enters the unit through an inlet spigot located directly above the dust collecting bin. Large particles drop into the bin as the air enters the unit due to a drop in air speed and to the sudden change in flow direction. The air is drawn upwards through the filter bags where the fine particles are collected. Finally clean air is drawn into the fan and then discharged either back into the factory or to atmosphere. The fine dust is deposited on the inside of the bag is dislodged after shut down of the fan by shaking so that the dust may fall into the collection bins. Shacking is carried out by an electric motor which is automatically actuated when the fan is de-energised and has been allowed to run down and stop. The dust collection bins may be removed for emptying by simply releasing the quick release and pulling forward. Access to the filter element and shaker and mechanism for inspection and maintance is through the large door on the front of the unit. For most applications the fan is contained within an acoustic enclosure. Secondary filter elements and enclosures are available. Units from 5m² to 150m² filtration area. Various filter media to suit your application. DustAway brochure is in Adobe Portable Document Format (pdf), you can download Adobe Acrobat Reader X10 for free from the Adobe website.